Offering you a complete choice of products which include unique wooden led-lit table top. 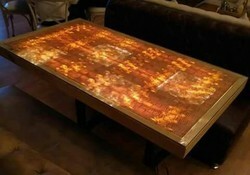 The Unique Wooden LED-lit Table Top adds beauty to the ambience. The LED light is dimmable and can be adjusted to your liking and comfort.